Ultimate sporting goal: To reach the highest level possible in swimming and to be a name everyone knows. Utterly dedicated to his two lifelong passions – photography and swimming – and inspired by his role model Kosuke Kitajima (multiple gold medal winner at the Olympic games), Harry demonstrates his determination to be the best he can be through his gruelling daily regime. ‘Each day starts off at 5.30am with swimming, followed by an hour in the gym, a full day of studying and then back to the pool for another swim session in the evening’. Award-winning Plymouth Leander coach Jon Rudd, also known for coaching Plymouth University Sporting Colours recipient and International Champion Swimmer Ruta Meilutyte, supports Harry throughout his development as an elite swimmer. 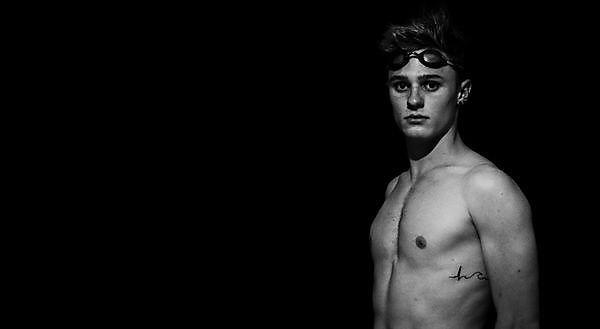 Recognising and relishing the benefits of having access to the world-class facilities and coaches at the Plymouth Life Centre, Harry embraces this fantastic opportunity to continue his studies and ramp up his sporting development. For Harry it was the offer of fantastic sports facilities and expertise combined with the reputation of Plymouth University’s BA (Hons) Photography course that drew him to the beautiful Ocean City of Plymouth. ‘I knew I wanted to study Photography after hearing great recommendations about the course in Plymouth from friends, then matching it up with the opportunity to take my swimming to the next level it was a no-brainer'. Harry’s talents shine through academically as well as in sport. In 2014 he won our university Christmas greeting competition and his artwork was displayed on The House screen for the Christmas break. On top of everything, Harry is excited and committed to supporting and representing the UPSU Swimming Club at key competitions including BUCS Swimming Nationals (Long Course), and has proven an inspiration and valuable addition to the club. What does the scholarship mean to you? Learn how University of Plymouth's Sporting Excellence scholarships support and enable our students to compete at a national and international level. University of Plymouth Sporting Excellence scholars take part in challenging training regimes. We work closely with our partner organisations to support the University of Plymouth's Sporting Excellence scholars. Our Sporting Excellence scholarships inspire and enable you to achieve your sporting and academic goals at one of the UK’s top universities. 1 May (outcome will be confirmed by 25 May).